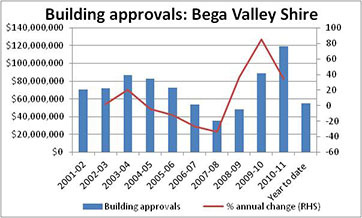 Bega Valley offers a number of properties which compliment the diverse lifestyle available in the Shire. From the undulating environment at the foothills of Brown Mountain to the beaches of Merimbula and Bermagui, the Shire provides several accommodation options including houses, apartments, service apartments and townhouses. In addition, the Shire has several rural properties which afford relaxed country living in the vicinity of major town centres. In terms of approvals for building construction, a total of $119.2 million worth of building projects were approved during the period 2010 to 2011.